You enter a dense wooded area, and are presented with three options. Do you; a) Proceed towards the village, b) Delve deeper into the forest, or c) Dare to enter the dungeon of the dreaded beast you have heard so much about? Who can resist the siren song of a dungeon filled to the brim with riches? Not you! Decision made, you gather your party, and try your hand at the various traps and trials that await you in the lair of the Boss Monster! But wait….This isn’t you…You are not some foolish adventurer here to try your luck at fame and fortune! You constructed this maze in hopes that the lure of treasure will tempt those who would dare venture into your trap! As the Boss Monster and you will have their souls! 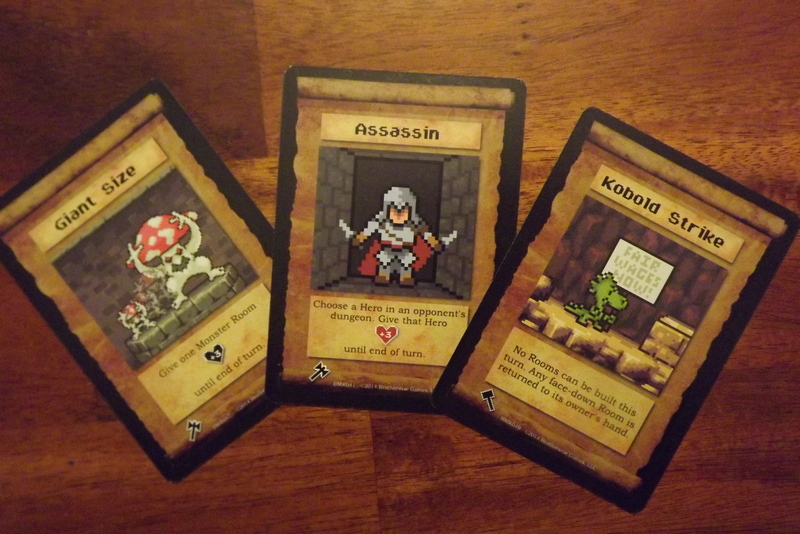 The object of the game is to build a dungeon out of random room cards to attract and then destroy various heroes. Once you get ten of their souls, you win the game! But be wary, for if you take five wounds you will lose. Two heroes are revealed to start the turn, and each player draws one room card. 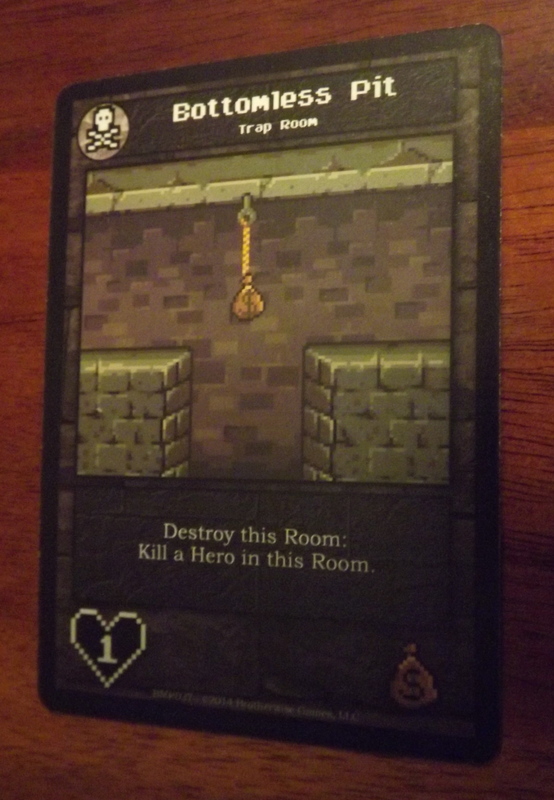 Whoever has the boss with the highest XP begins and “builds” one room in their dungeon by placing a room card face down (ordinary rooms are placed to the left of any existing cards and advanced rooms can be played on top of these). Next, the cards are all simultaneously revealed. Heroes? Don’t make me laugh! 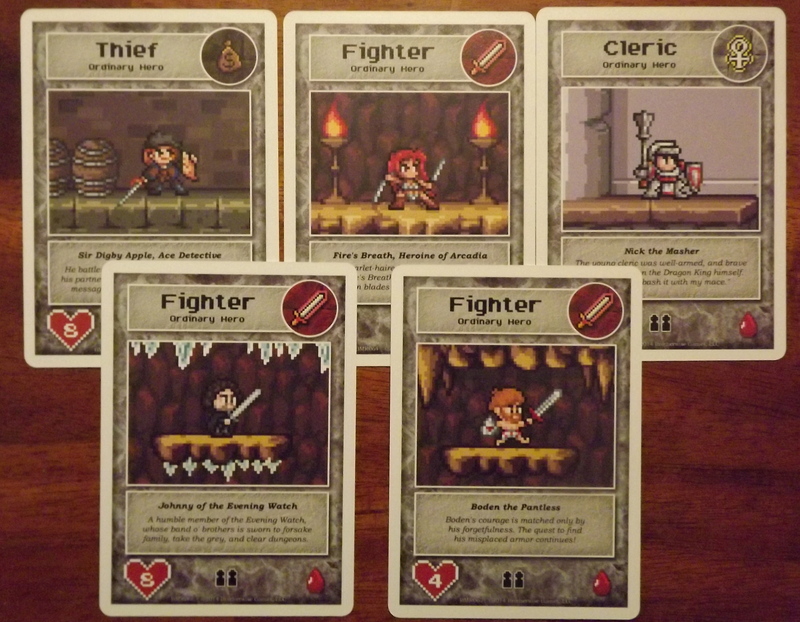 Each hero card then moves to the dungeon with the most treasure icons that interest that particular hero. The hero then tries to make it through your dungeon by interacting with each of your room cards. If the damage they suffer is greater than their health, then you get to claim their soul. If they make it through to your boss card with health remaining, then your Boss gets a wound. Spell cards can be used at any point, as indicated by the card. These have a wide range of potentially game altering effects. During the setup you receive two spell cards and it is your choice to keep both, one or neither of them. Any other spells you gain throughout the game will come from your room cards. Play continues until one player reaches 10 souls, or all other players are eliminated from the game. Tons of Treasure or Plagued by Pitfalls? One of my favorite things about this game is the old school 8-bit style art that is reminiscent of video games from my youth. The theme and the artwork is really where Boss Monster shines There is definitely the pull of nostalgia there, and I am sure a lot of people have gotten the game for this factor alone. 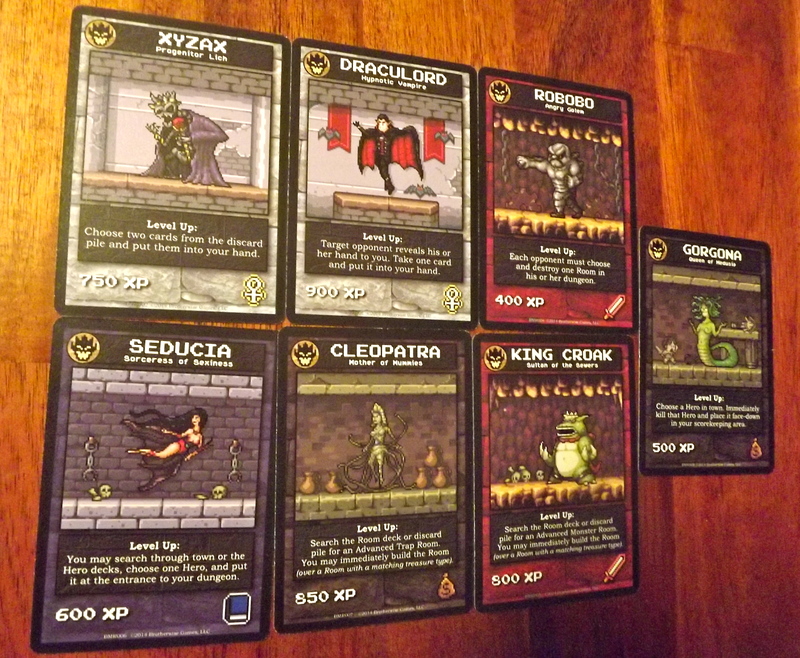 The humor used throughout the cards reflects the theme as well, and it helps with the feeling that you are playing a dungeon crawler. Unfortunately, if the theme isn’t something you are into there just isn’t enough to the rest of the game to keep you interested. The gameplay alone isn’t strong enough to carry it beyond the theme. Since you only draw one card per turn, it makes this game extremely random. Luck plays very heavily into how well you do. If you draw poorly, I found that there are very few ways to recover. Heroes only head to the dungeon with the most of a certain treasure icon, and if your random room cards don’t have the icons required (or not enough of them), then you simply won’t attract any of them. How far with the heroes get? In one play through, my opponent snagged almost every hero before I could attract even one, just because his dungeon had more of everything. I only had rooms with one specific icon on them, and that hero was close to the bottom of the deck (each hero has one or more icons that will attract them to your dungeon) . I was out before I even had a chance to do anything! Which leads to the next issue I had with this game; player elimination. Being a short game, at least you aren’t sitting around for a long time if you do get eliminated, but the game is simply boring to watch. I find that I much prefer this as a two player game; at least then, as soon as one player is eliminated the game ends. Interaction between the players is also severely lacking. I could play it solo and it really wouldn’t make any difference to the outcome. The only aspect that provides any interaction between yourself and the other players are the spell cards, and those are rarely drawn. You can even go a whole game without drawing one, or even wanting to waste a turn drawing one. Because of this, people tend to save them up for some future turn that may never happen. I have played entire games where not even a single spell card is played. For a game called Boss Monster, the fact that your boss cards do very little is frustrating. Each boss has one power but can only use at a certain point in the game. Once again, there have been games that I have played where I haven’t even had the chance to use my boss’s special ability. Either I never draw the cards I need, or the game is over before I have the chance to activate the power. Regardless of how cool a power looks on paper, if you can’t control whether or not you can use it, it feels limited and annoying. I like to role play my games, and I just can’t picture myself as a big bad monster at the end of a dungeon, watching a hero waltz right by me and not do anything about it. That is not what any video game villain would do! Should you use this room’s special ability or keep it for a more difficult hero? 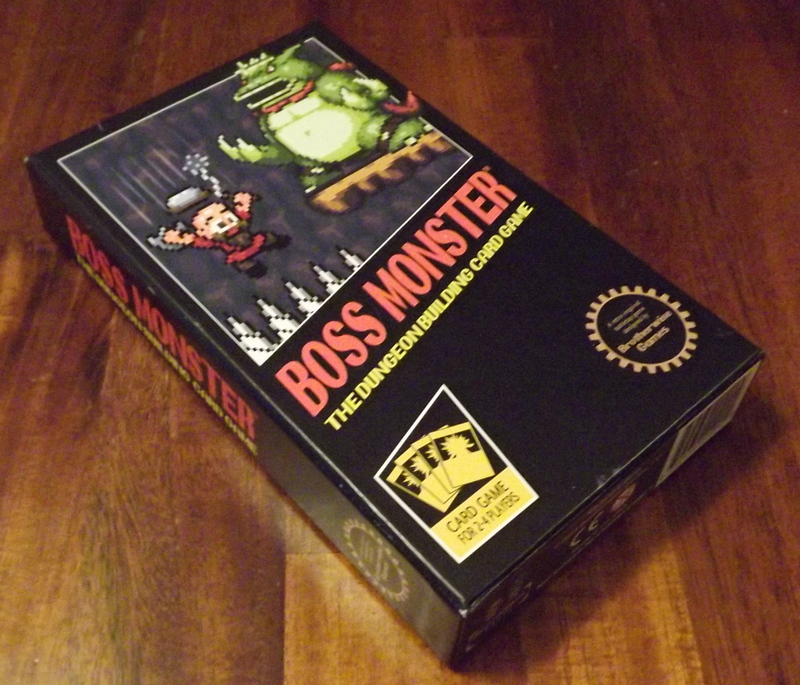 Boss Monster is a nice light filler game, and I relished in finding all the different combos between the different rooms you can get for your dungeons. But there just isn’t enough game here for my tastes. If you are plagued by bad card draws, then getting your dungeon to a point where it can face the heroes can take forever, and by that point, the game might already be over. Cards are the main component to the game, and they are decent quality, although perhaps a bit on the thin side. At least for now, they shuffle well and feel durable enough, so they should be able to withstand the wear and tear of regular play. The box is sturdy, and has an insert that helps separate the various decks that are included. I really wanted to enjoy this game more than I did. I had fun finding combinations, and I adore the artwork, theme and humor, but it was just too random to actually have any fun with. Once I got my dungeon into a place that I thought I could handle the heroes, the game would be over. If there was a bit more depth and a lot less luck involved, it might reveal a very solid game. Unfortunately, the way it is feels far too lacking. Trying to find the best combinations of rooms is fun. Way too random and luck based. Not enough interaction among players. If the theme isn't a draw for you, the game play isn't strong enough to interest you. Have you revisited this with the expansion that includes the Item cards? Seems to greatly improve the core game. The problem here is and was caused by kickstarting it, the core game was just too watered down and lame, the perks to the backers were more of essentials and needed to be in the retail box.